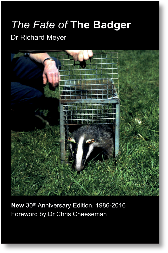 Richard Meyer’s The Fate of The Badger is arguably the most comprehensive and well-informed account of the modern history of badger persecution in Great Britain. This well-researched book deals in detail with the successive British governments’ war of attrition against this much loved native mammal. First published 30 years ago, Richard’s research and commentary is as relevant now as it was then. This new edition is brought right up to date with a new chapter covering more recent developments as well as two new appendices dealing with Wales and Ireland. The fate of the badger - What can pride and prejudice teach us about the fate of the badger? From What can pride and prejudice teach us about the fate of the badger?